Dedicated free-lance journalist with three years of experience as a news correspondent, translator, and editor. Taroudant- According to the Maghreb Arab Press (MAP), the Moroccan community in London recently held a reception day at Al-Hasaniya Moroccan Women’s Centre in honor of Hussein Sabbah, the first Moroccan who served as a social worker in the UK. Speaking on the occasion, Souad Talsi, founder of Al-Hassaniya, based in London, praised the human qualities and services provided by Sabbah for the benefit of the Moroccan community throughout his career. 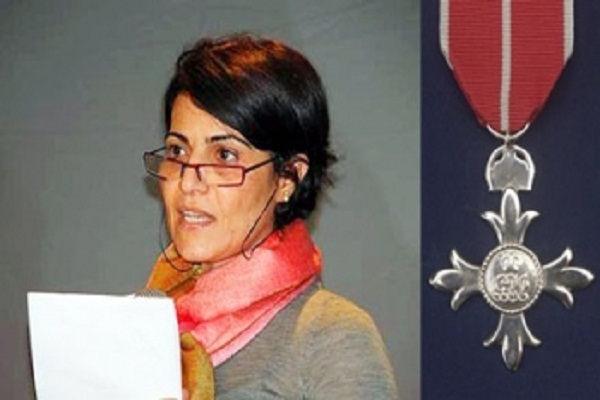 Souad Talsi, a recipient of an award of Most Excellent Order of the British Empire (MBE) for her services to the Moroccan community in Britain on the Queen’s birthday, , praised Sabbah’s dedication to serve the Moroccan community. For his part, Sabbah, who was forced to retire due to his health conditions, said he was very moved by this event and thanked all those who have honored him with their presence and come to show him their support and solidarity. “I am proud to have been a source of inspiration and a model for some young Moroccans who could join the social assistance services,” Sabbah said, adding that he is honored to have served the Moroccan community selflessly for almost thirty years. For his part, Rachid Agassim, the Consul General of Morocco in Britain thanked all those who helped organize the reception to pay tribute to a person who has dedicated his life to serving the Moroccan community. Named as one of five winners of the Guardian Charity Awardsin 2010, Al-Hasaniya Moroccan Women’s Centre provides support in all matters concerning the health, welfare, education and cultural needs of Moroccan and Arabic-speaking women and their families in London and the UK.